What Does a Dairy Farmer Do? The primary duty of a dairy farmer is to manage dairy cows so that they produce maximum quantities of milk. Most farms have a staff to be supervised ranging from a few employees to several dozens, so personnel management skills are also beneficial to a dairy farm manager. Dairy farmers care for cows that supply milk and oversee the harvesting of their milk. Some dairy farmers own their cow herds, as well as the land that the farm is on. Others work on large farms owned by corporations in the food and agriculture industries. Some farms, especially small operations, grow and harvest feed for their cattle on site. They may also breed and raise their own replacement heifers. Dairy farmers must deduct a number of expenses from their net profits to determine their final profits or salary for the year. These expenses include the cost of labor, insurance, feed, fuel, supplies, veterinary care, waste removal, and equipment maintenance or replacement. Experience: Direct, hands-on practical experience working on a farm with dairy cows is an important prerequisite for becoming a dairy farmer. There is no substitute for learning the business from the ground up. Most dairy farmers either grow up on a farm or apprentice with an established operation before venturing out on their own. Many aspiring dairy farmers also learn about the industry early on through youth programs. These organizations, such as Future Farmers of America (FFA) or 4-H clubs, give young people the opportunity to handle a variety of farm animals and to participate in livestock shows. 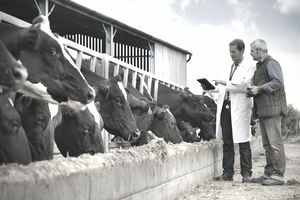 Education: Even if they inherit the family farm, most dairy farmers hold a two- or four-year degree in dairy science, animal science, agriculture, or a closely related field of study. Coursework for such degrees generally includes dairy science, anatomy, physiology, reproduction, crop science, farm management, technology, and agricultural marketing. Mechanical skills: Dairy farmers must be able to operate and maintain complex machinery. Physical strength: The job involves strenuous, repetitive tasks, such as lifting and bending. Analytical skills: Critical to the success of a dairy farmer is the ability to assess the health and production strength of its cows, as well as the factors that influence that. Interpersonal skills: Dairy farmers may need to supervise laborers and other workers, and they also may need to work with vets and nutrition specialists to coordinate care and feeding of the cows. The U.S. Bureau of Labor Statistics predicts that job opportunities for farm and ranch managers will decline 1 percent through 2026. This reflects the growing trend towards consolidation in the industry, as small producers are absorbed by large commercial operations. As is common with most agricultural management jobs, work occurs outdoors in varying weather conditions and extreme temperatures. Working in close proximity to large animals also makes it imperative that dairy farmers take proper safety precautions. Dairy farmers may be self-employed or work for a large corporate entity. Some farmers, especially smaller self-employed producers, are part of cooperatives such as Dairy Farmers of America. Cooperatives can negotiate competitive rates as a group and have special access to guaranteed markets for their milk. The hours a dairy farmer works may be more than a typical eight-hour work day, and night and weekend shifts are often necessary. The work generally begins before dawn each day.